Intended for those who want to get started in the domain and learn how to set up a task, what interfaces are available, how to assess the work, etc. as well as for those who already have used crowdsourcing and want to create better tasks and obtain better assessments of the work of the crowd. It will include screenshots to show examples of good and poor interfaces; examples of case studies in speech processing tasks, going through the task creation process, reviewing options in the interface, in the choice of medium (MTurk or other) and explaining choices, etc. 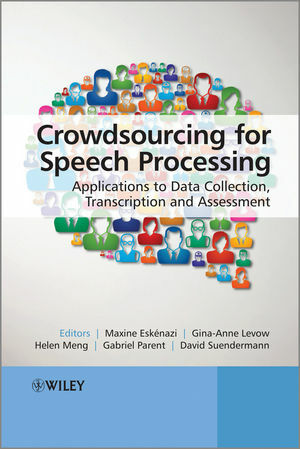 Provides an insightful and practical introduction to crowdsourcing as a means of rapidly processing speech data. Addresses important aspects of this new technique that should be mastered before attempting a crowdsourcing application. Offers speech researchers the hope that they can spend much less time dealing with the data gathering/annotation bottleneck, leaving them to focus on the scientific issues. Readers will directly benefit from the book’s successful examples of how crowd- sourcing was implemented for speech processing, discussions of interface and processing choices that worked and choices that didn’t, and guidelines on how to play and record speech over the internet, how to design tasks, and how to assess workers. Dr. Eskenazi is Principal Systems Scientist at the Language Technologies Institute, Carnegie Mellon University, USA. She has authored over 100 scientific papers in the areas of computer assisted language learning and speech and spoken dialog systems. Her work has produced such systems as the Let's Go spoken dialog system and the REAP vocabulary tutor. She is also the founder and CTO of the Carnegie Speech Company. Dr. Levow is currently an Assistant Professor in the Department of Linguistics, University of Washington, USA. Prior to joining the faculty at the University of Washington, she served on the faculty at the University of Chicago in the Department of Computer Science and as a Research Fellow at the University of Manchester, UK. She served on the Editorial Board of Computational Linguistics and as Associate Editor of ACM Transactions on Asian Language Processing. Dr. Meng is Founder and Director of the Human-Computer Communications Laboratory at The Chinese University of Hong Kong, and is also the Founder and Co-Director of the Microsoft-CUHK Joint Laboratory for Human-Centric Computing and Interface Technologies, which was conferred the national status of the Ministry of Education of China (MoE) Key Laboratory in 2008. Prof. Meng also served as an Associate Dean (Research) of the Faculty of Engineering from 2006 to 2010. She serves as Editor-in-Chief of the IEEE Transactions on Audio, Speech and Language Processing. Gabriel Parent is a Software Development Engineer at Amazon.com working on solving natural language related problems. His main research focuses were human-computer interaction through spoken dialog systems and crowdsourcing. Dr. Sundermann is currently full Professor of Computer Science at the Baden-Wuerttemberg Cooperative State University, Stuttgart, Germany. He is also the Principal Speech Scientist of SpeechCycle, New York, USA which has been recognized by Deloitte as a "Technology Fast 500" company based on revenue growth. He has authored more than 70 publications and patents, including a book and six book chapters.